What a wonderful way to use ripe bananas! And the oatmeal adds some extra fiber. An easy mess-free treat that only requires a few minutes of prep time. Just adds your cake ingredients to your blender, mix, place in a prepared pan, and bake! 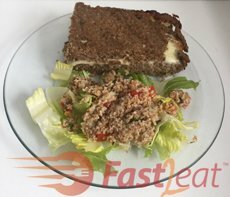 Something sweet yet healthy, the oats and brown sugar taste great in this cake that provides you with a lot of proteins and fibers. It’s perfect for a healthy busy day snack cake with no refined flour! You can eat it as a dessert, breakfast, brunch, or snack. It’s healthy very dense and chewy but also moist and flavourful. Enjoy this cake cold, at room temperature or warmed, with or without ice cream and /or whipped cream. It’s the simplest way to prepare a white fish fillet (such as Fresh Cod or Haddock or Tilapia or Bass). So much flavor… so easy, healthy and tasty! Ideal for busy weeknights. Fast and easy to prepare, and no frying needed! Oven-baked fish is a perfect alternative to the more caloric fried version. Baking is easier than frying as you don’t need to stand at the stove and actively cook it. You just put the fish in the oven and take it out when it’s ready – so easy! You can multitask while the fish is baking – for example, make the salad! It’s a “lemony” variation from this “cheesy” Crispy Oven-Baked Fish Fillets Fast2eat. This recipe for Smoked Ham with Orange Sauce is made with a fully cooked smoked ham and is glazed with a sauce made with orange juice, brown sugar, honey, Dijon, ginger and mint. It couldn’t be simpler which makes this Smoked Ham with Orange Sauce great not only for Holidays, potlucks and get-togethers but also for a weekend meal prep. Baking a ham might seem like a monumental undertaking but trust me, it’s not. Using a fully cooked smoked ham can simplify the entire process. If you’re feeding 10 adults with side dishes you’ll want to plan on buying a 2kg/4.5-pound fully-cooked smoked ham. This may seem like a lot but the protein is often the first thing to get gobbled up and you’re going to want leftovers for future soups, salads, pasta sauce, pizza toppings, omelets, sandwiches and more. No more boring, flavorless hams for you… It’s sweet, tangy, and full of flavor… The light and citrusy sauce is what makes this ham so special. It’s a luscious sauce for any Pasta or Spaghetti Squash. Also, give it a try with potatoes or just au gratin topped with potato sticks. I was looking for an easy and delicious recipe to use this Pre-cooked Chicken and Chicken Stock Fast2eat that I’ve previously made. The result consisted of a silky and creamy dish: Chicken Béchamel sauce, Shredded chicken, spices and herbs tossed with a Spaghetti Squash (or with any pasta or potato, as a filling for this Brazilian Blender Savoury Pie Fast2eat or just itself au gratin), and topped with melted mozzarella. Baked until nice and brown. This creamy chicken is really satisfying and surprisingly low in calories. Lots of flavors, which work together very well in a delicious and simple dish! The result was nothing short of marvelous. We loved it!!! This Shrimp Sauce recipe can satisfy a number of meal occasions and is sure to impress. It’s quick and easy. It’s perfect for casual entertaining as it is packed with flavor. Use jumbo shrimp if you want to make it impressive! 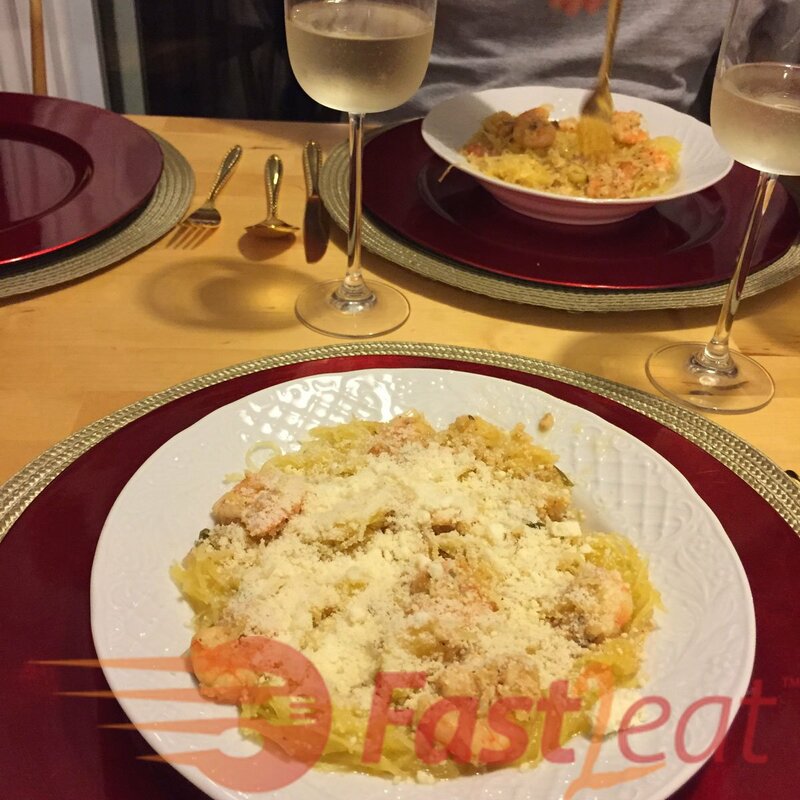 Use it with Spaghetti or any short pasta such as penne, or try this Fast2eat shrimp sauce with a low-carb, healthier alternative to pasta using spaghetti squash! It’s still amazingly delicious with half the calories! Spaghetti squash is a favorite ingredient for those seeking a lower-carb, paleo-friendly, clean eating, gluten-free alternative to pasta. If you prepare the spaghetti squash in advance, it is ready in minutes. Let’s be honest—store-bought sun-dried tomatoes tend to be a bit leathery and tough, without much flavor. They seem like a faded, desiccated memory of a tomato, rather than a fragrant, intensified taste of summer days. Homemade “sun-dried”1 tomatoes, on the other hand, are another thing entirely: fragrant and chewy but not tough, with complex, concentrated tomato flavor and a slight sweetness. Slow baked in the oven makes these oven dried tomatoes the best. Drizzle with olive oil, toss with spices to make the perfect appetizer or side dish. Not a labor-intensive process, but certainly a lengthy one. Of all the methods for preserving tomatoes, drying them in the oven is the least fussy. Plus, drying preserves their sweetness and flavor best. And these flavorful little gems cost so little when made at home; it’s worth the time they need to achieve that chewy, raisin-like texture. One thing I can guarantee is the appetizing fragrance in your house of tomatoes slowly roasting to dried perfection, especially if you choose to season them with garlic and herbs. In the meantime, think of all the tomato bread, salads, pizzas, pasta, pestos and sauces you’ll be able to make once they’re done. It’s tempting to prematurely devour those tiny little sweeties, hot, pungent, sweet & salty with good virgin olive oil as they are, spread on crackers or toasts. So what’s so special about the way Brazilians cook rice? What makes this so different is that we fry it in oil with minced garlic and sometimes chopped onion before adding water. I dare you try this way and tell me you prefer plain tasteless rice instead. I know that you will never go back to eating boring unseasoned rice again. This is how to cook the perfect fluffiest flavourful rice! It’s not hard at all but, like hard boiling eggs, cooking rice is one of those tasks that appear to be easy, but can go wrong very quickly if you don’t follow the right steps. Here are simple instructions that will help you make rice that turns out light, flavourful and fluffy every time. The secret is to not let it overcook because it should come out loose and not sticky. Slow-roasting tomatoes bring out such sweet, intense flavor. You get almost all of the concentrated flavor of sun-dried tomatoes but without the drying. Mixed with tons of garlic, oregano, and fresh basil, I don’t know how it works… but it tastes like heaven in your mouth. They take on an intensely deep flavour after roasting and can be used in many different ways. It’s perfect to eat with toast, bread, crackers, salads, pasta, goat cheese, bocconcini… you name it. My mom makes it since I was a child and everyone loves it. It’s easy, Fast, and colorful. It looks so festive that I decided to publish it for the New Year’s Eve parties. 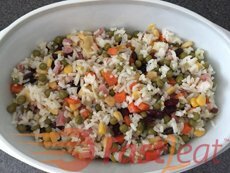 Arroz à Grega (“Greek-style rice” – Although given the name “Greek”, in Greece there is no such rice dish) is a Brazilian dish, consisting of rice (of course) cooked with raisins and small pieces of vegetables, the most common of them are small cubes of carrot, green peas, sweet corn and green onions. It can get small bits of ham (smoked or not), sausage and/or turkey breast (smoked or not), among other processed meat supposed to be eaten cold, but if chicken meat or shrimps are used, it is instead known as risotto. Tabule (also Tabbouleh, tabbouleh or tab(b)ouli) is a vegetarian dish (sometimes considered a salad) made of bulgur, tomatoes, finely chopped fresh mint, parsley, green onion, and onion, all tossed and seasoned with olive oil, lemon juice, and salt.